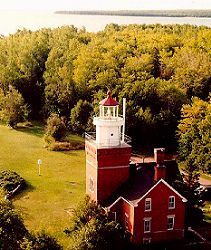 A unique bed and breakfast, in one of the few surviving residential lighthouses in the country. 28 miles north of Marquette, off CR 550, at the end of the road. A secluded retreat from modern life offering seven rooms, all with private bath, living room with fireplace, library, sauna, 1/2 mile of Lake Superior shore, and 50 wooded acres for walking. An ideal area for hiking, mountain biking, snowmobiling, cross-country skiing and more. Open year round. Grounds open to the public daily, May 1 through October 31, 1:00 a.m. to 4:00 p.m. Eastern Time. Spa services available in the Serenity Massage Hut during the summer, and in the lighthouse for the rest of the year. This and other Lighthouse Bed and Breakfast Inns can be found here in The Register.